Apple is on an incredible run. The stock has soared nearly 30 percent this year, gaining $200 billion in market cap in that time. Shares of the tech giant closed slightly lower on Tuesday, snapping nine straight days of gains and breaking what would have otherwise been its longest daily winning streak in more than eight years. In Wednesday's premarket the stock was down nearly 1%. Tuesday's decline notwithstanding, Apple has bounced back since its steep slide at the end of 2018. Shares of the tech giant have gained 26% this year, outpacing the tech sector and the broader market, which are up 22% and 15%, respectively. Some strategists — including Miller Tabak's Matt Maley — say the stock may have run too far, too fast. He believes a pullback would be healthy, and that investors should use any upcoming dips as buying opportunities. "On a near-term basis, it could be getting ready for a pullback," he said Tuesday on CNBC's "Trading Nation." "If you look at its RSI chart it's getting overbought." The relative strength index, or RSI, is a momentum indicator that technicians use to evaluate overbought and oversold conditions in a stock. 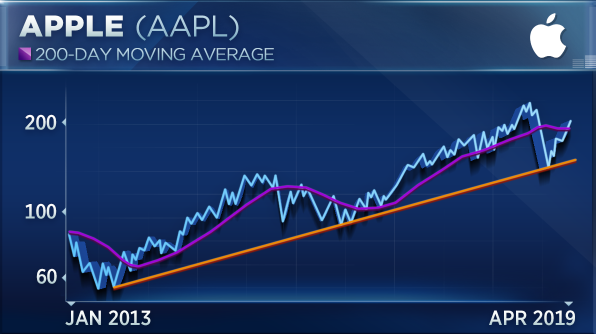 And given Apple's 40% bounce from its Jan. 3 low, Maley argues that the stock is overbought. Maley also notes that based on the chart's pattern, the stock may soon take a breather. 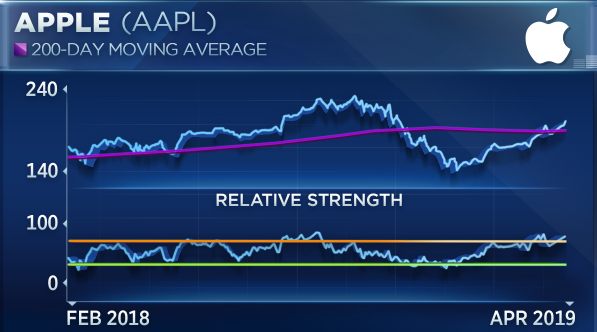 Looking at performance from the late 1990s to the present, he points out that each time the stock has had a sharp move higher — like this year — there's been a subsequent pullback. But he believes any dip will be short lived, and he remains bullish on the long-term trajectory. "I think ... people who like the stock might want to look to buy it on its next dip rather than chase it at these levels, but long term, the stock looks great," he said. Last month, Apple announced three new subscription services, including a TV service, gaming bundle and all-you-can-read magazine subscription. The company also said it will release its own credit card — Apple Card — in partnership with Goldman Sachs. Strategic Wealth Partners' Mark Tepper believes the company's shift to more of a services-focused business will continue to drive the stock higher. "We are bullish now that they're transitioning to services and wearables. What we're really seeing is analysts are finally beginning to apply different multiples to their different business lines, which is good. Investors now have an opportunity to get in close to the ground floor on that transition," he said on "Trading Nation." He wasn't always a believer, noting that he was bearish on the stock last year when the company warned about slowing iPhone sales. But now he thinks the stock is a name to own for the long term, since it now appeals to value investors and GARP (growth at a reasonable price) investors, meaning "the sandbox is twice as big." "Sentiment on the Street has never been more negative on Apple. It's typically a consensus buy, and right now it's 50-50. And as soon as the Street flips, the stock's going to soar, so we do like it," he said. Disclosure: Strategic Wealth Partners owns shares of Apple.